I FINALLY finished up the last of the options for my (first) Lion Rampant retinue. By “options” I essentially mean I have painted FAR more units for this retinue than would be allowable in the standard 24-point retinue the game suggests – and far more than I’d ever be able to scrape together an opponent for… Heck I could make TWO retinues out of this batch! The force is based around retinue of Baron Philippe du Lapin - a character I used as the leader of a Brettonian Warhammer Fantasy Battle army… oh… 25 years ago (and possibly used as a character In Warhammer Fantasy Role-Play)!? (and in many other medieval skirmish games since then!) In fact some of the soldiers in a few of these units are from that very army – a mix of Citadel and Wargames Foundry figures that were all made by the Perrys (and I swear identical figures were marketed by both GW and the foundry at the same time!). These are the figures I just finished up this week to finish off the Retinue. The Figures are from Crusader Miniatures which I picked up as part of a Lion Rampant Deal from North Star Figures. The last of the Crusader Miniatures which I picked up as part of a Lion Rampant Deal from North Star Figures that I kept for this force (the rest became part of my “opposing force”/Bad Guy retinue that I’m doing mostly in green and yellow). Mostly old Wargames Foundry figures that I’ve had for decades. 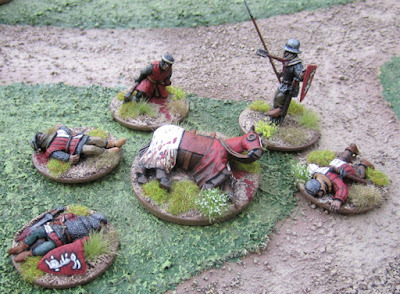 The only units not in red and white – because they’re sneaky-skirmishy woodsmen! More of the old Wargames Foundry figures that I’ve had for decades. More of the old Wargames Foundry I got at the same time as the bidowers above – for the most part – there are a few home-cast figures hiding in the back that I added to fill out the ranks! Of course these could also be used for any other game that doesn’t have too specific basing requirements – I have used some of these in A Song of Blades and Heroes (and many would be perfect for Song of Arthur and Merlin) – which I still love for lower level skirmish gaming. I do have stuff for two more Lion Rampant retinues. 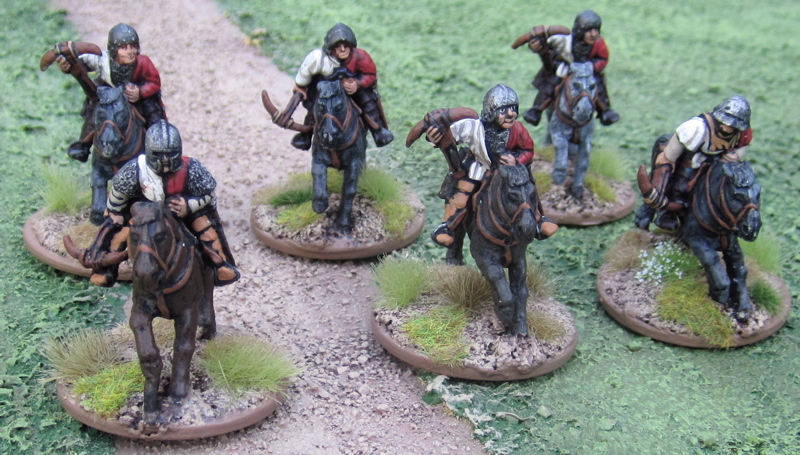 Another Generic Medieval (the “opposing force”) and a not-so-generic Medieval Irish retinue – with lots of Fierce Foot and Bidowers and a few hard-hitting Gallowglass!). I’m quite looking forward to Dragon Rampant - perhaps I’ll be able to reorganize a few more of my old fantasy forces into small units for slightly larger scale actions with this system. Also my kids have been working a couple of ) Lion Rampant retinues of their own (or WERE working, rather, as they’re onto other stuff at the moment). I picked up a pile of Hät 28mm plastic El Cid figures from a store that was blowing them out - originally for them to make DBA armies, but then are more interested in individually based figures for skirmishing with… The Boy has a force of Andalusians and The Girl has a force of Almoravids. I hope someday they get them done! I’m kind of torn as to what to work on next. I really should prioritize and make the best of my limited painting time… probably 40K or fantasy skirmish stuff… seems most likely to be needed/played with in the not-to-distant future. Nice! I have some as well. I'd originally thought of putting them together on a base to call camp followers for my Irish DBA army, but then decided not to bother with multi-figure camp follower bases, but rather simply occupy the camps with individually based camp followers (which would be more versatile as they could be used for skirmish games as well then!). That's a superb force - they look great en masse. Thanks! This is probably the primary reason I finished them up - not so I could actually play a game with them - but so I could take a picture of them all together and say; "Done!" I love the bunny heraldry, that is even better than the Hello Kitty Space Marine army I once saw. I also have some of those old WF medieval figures, and I really need to haul them out once I move next month. I've been thinking that LR might be the way to do it. How do you like the rules? It's been a while since we tried them out. They weren't so bad that I dismissed them entirely! I seem to recall feeling it was hard to get troops to activate and DO stuff and had considered tweaking the activation numbers or simply allowing the presence of the leader to give a bonus to order activations in the same way he gives a bonus to morale rolls if he is nearby...? Otherwise it must have been simple and fast-playing enough for me to continue painting units for it....? Oh and there was something about space between units that seemed a bit clunky...? I guess I'll have to have another go to remind myself why I wanted to keep playing it!? 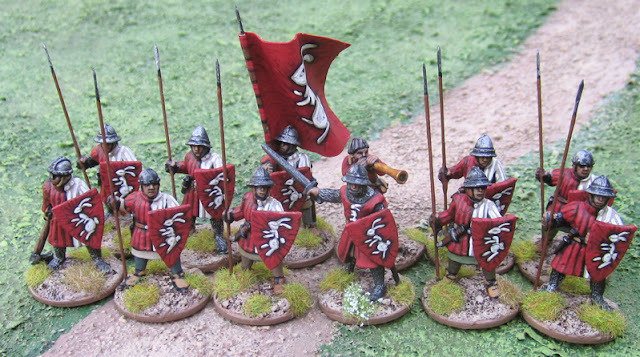 Impressive bunny-themed forces for Lion Rampant. Maybe that should be "Rabbit Rampant?" Rabbit Rampant works just as well. For some reason Bunny Rampant tickles my fancy more...? I've already started painting a bunch of them in a green and yellow sort of scheme... but I do like foxes. So many predators to choose from... Lynx, foxes, wolverines, assorted birds of prey.... Perhaps I should use the green and yellow scheme to tie the force together and different predator devices on each unit? Beautiful! But let the good Baron not get too sure of himself and his large forces, less some up and coming German Prince make hasenpfeffer of them. Indeed! Oooh that's good - I could make an entire germanic force called the Hasenpfefferers? Excellent stuff Tim Love the bunnies! Marvelous looking retinue(s), Tim. Here's a unit you might want to add as an option - mounted Yeomen archers. Although I've yet to use them in a game, I like their movement and missile range. If ever I were to add MORE stuff to this (or any of the other retinues I have to Paint) I would definitely give those a try... But I'm trying to reduce the lead mountain at the moment! Actually now that I think about it - I think The Girl has some mounted archer types in her Almoravid force... So we shall get to try them out at some point! What did you use for the cavalry bases? Also how did you make your banner? They look great btw, and inspired me to pick up the game! I use metal washers for all my bases. I'm wondering what you uses for your cavalry bases? They all look great btw! Amazing figures, congrats, have you played games with more than 24 pts per side? how many? works fine? Thanks! I have not played with more than 24. To be honest, I've only played the game once so far - something I hope to rectify in the coming months! The plan wasn't necessarily to play with bigger forces - just have lots of OPTIONS!